What are my account settings? 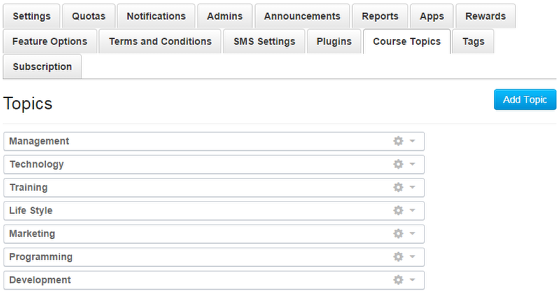 To open the settings page for any account or sub-account, in Global Navigation, click the Courses drop-down menu . Under the Managed Accounts heading , click the name of your account. In Account Navigation, click the Settings link. In the Settings tab, you can specify settings for the entire account, including account name , default language , default time zone , and self-enrollment option . If your account is not already using an external identity provider (IdP) for authentication, you can customize the login label for your account's login page . Note: The sub-account settings look different than the account settings. The Quiz IP Address filter allows an admin to setup a set of IP filters that can be used to limit quiz-taking to those filters. This is often used by an organization to limit tests to an on-campus testing center. Note: Sub-account admin can set Quiz IP Address Filters. 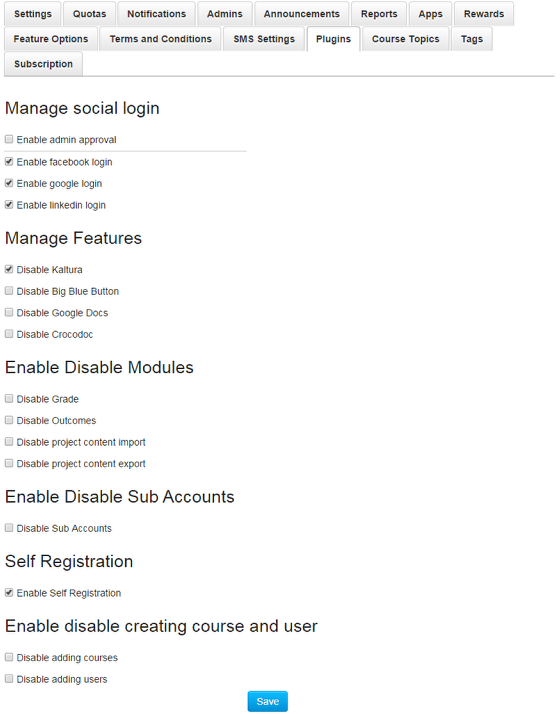 The Features section of this page is where you enable or disable certain built-in functionality of Sublime LMS. This is also where, in the case of equalla and Turnitin, you enable those third-party integrations. Note: Sub-account admin can only set Equella, Turnitin, Analytics, and User Avatars. Note: Sub-accounts can be branded, but the top-level account admins need to click the Let sub-accounts define additional includes checkbox. Learn more about branding sub-accounts. As an account admin, you can add custom help links for your organization. Click Add a custom help link . Select the appropriate Available to: checkboxes (all users, students, teacher, or admins) to view the link. Note: Sub-account admins cannot customize links for the help dialog box by default. Also, to remove the customized help link, click the Trash icon . To view the customized help link, in the Help Corner, click the Help link . View your custom link . 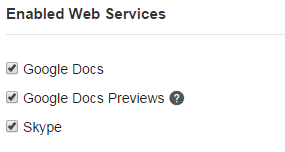 The Enabled Web Services section is where you enable third-party integrations. These integrations can be used to extend the functionality of a user's Sublime LMS profile. For example, when a user connects their Facebook profile to their Sublime LMS user profile, Sublime LMS can send that user private Facebook messages about new assignments, quizzes, messages, etc. This is all configurable in the user's Notification Preferences. 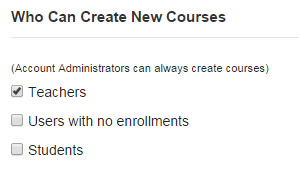 You can choose who can create new courses within your account. Remember to click the Update Settings button when you make changes. 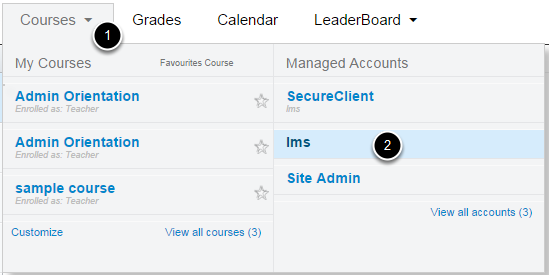 In the Quotas tab, you can set default account quotas for courses, users, and groups. 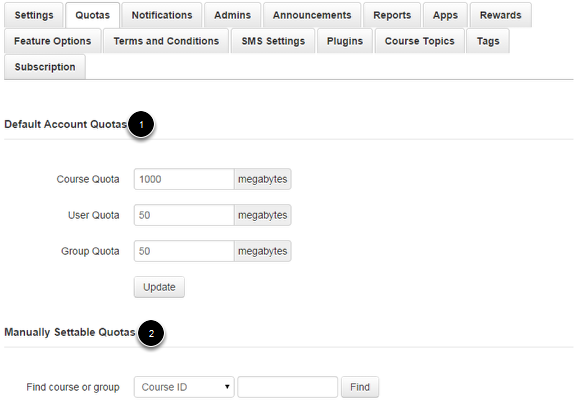 You can also set quotas by Course ID or Group ID. In the Default Account Quota  section, type a new number in the quota fields to change the quotas. 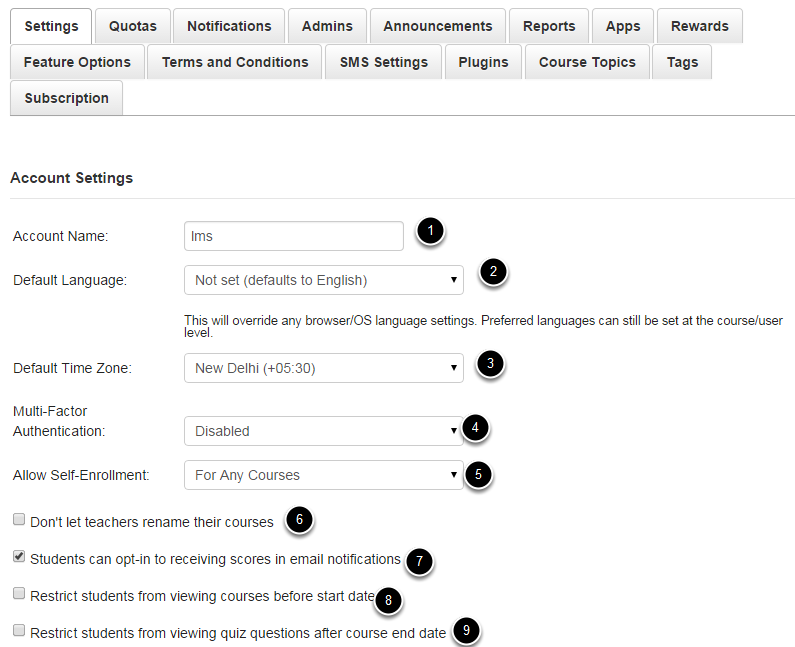 This will change the quotas for courses, users, and/or groups for the entire account. Click the Update button when you are finished to save your changes. 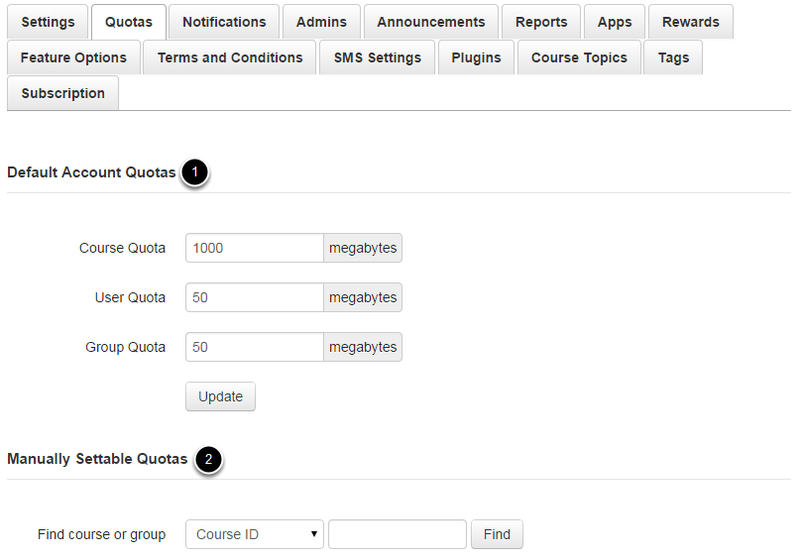 In the Manually Settable Quotas  section, search for a course or group by entering the ID number and clicking the Find button to change the quota for that specific course or group. 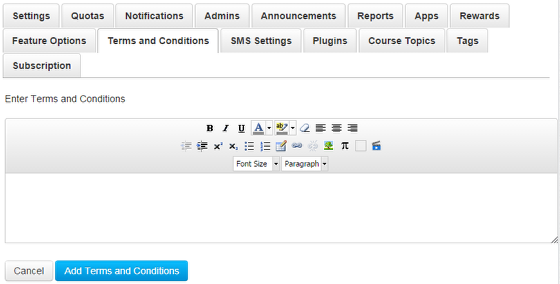 Once you type a new number in the quota field, click the Update Quota button to save your changes. Note: The course ID is located at the end of your course URL . 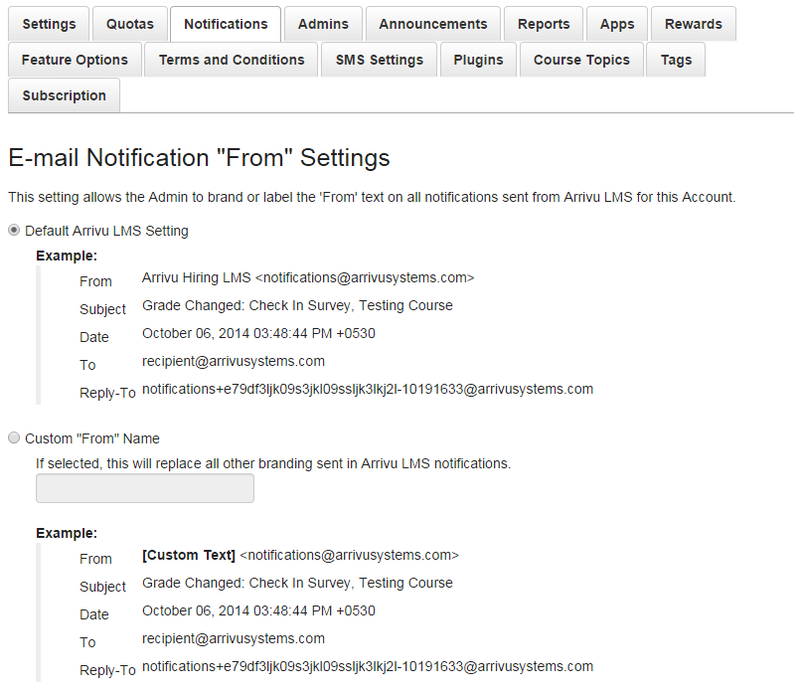 In the Notifications tab, you can set up a custom "From" text field for Sublime LMS notifications. This custom text can be your institution name or whatever sender information you would like to use. Using the custom text field helps student identify notification emails more easily and improves the quality of student-instructor interaction. By selecting the pop-up message checkbox, a pop-up warning will alert users that adding a non-institution based email address may result in the exposure of sensitive content. In the Admins tab, you can view and edit the admins assigned to this account. If you are working with sub-accounts, admin privileges are limited to the scope of just that sub-account and below. In the Announcements tab, you can send out global announcements to every user in that account. These announcements are used to announce events such as building closures, class cancellations, holidays, etc. Learn more about global announcements. Note: Only top-level account admins can send global announcements. Global announcements are not available in sub-accounts. The Reports tab is where custom reports will appear after you design them. 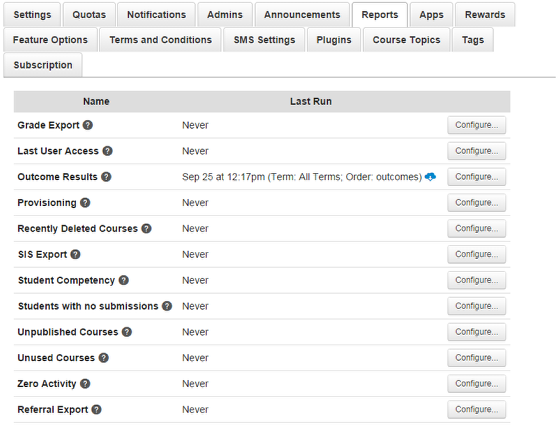 There are many more reports available in Sublime LMS, they just aren't listed on this page. They are available in context. Quiz reports, for example, are available from the quiz page itself. User reports are available on the user's profile page. 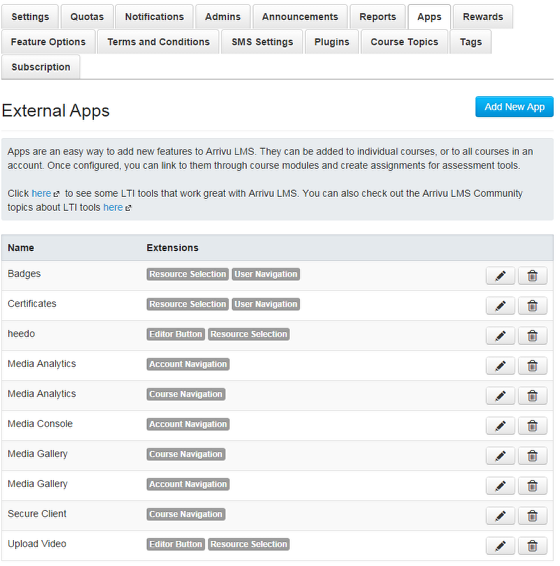 In the Apps tab, you can view all available external learning tools in Sublime LMS. External learning tools are often developed as LTI integrations. These tools may be published along with a textbook, and access to these tools is often restricted to students in the course. Any LTI provider should be able to give you the information you need to configure the tool in Sublime LMS. Once configured here at the account level, it is available to any course designer or instructor in the account. 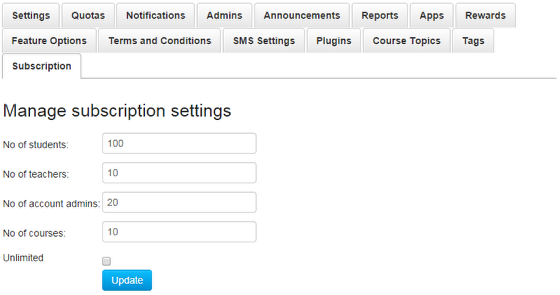 The Feature Options tab displays new features that are available to your account on both the account and course levels. 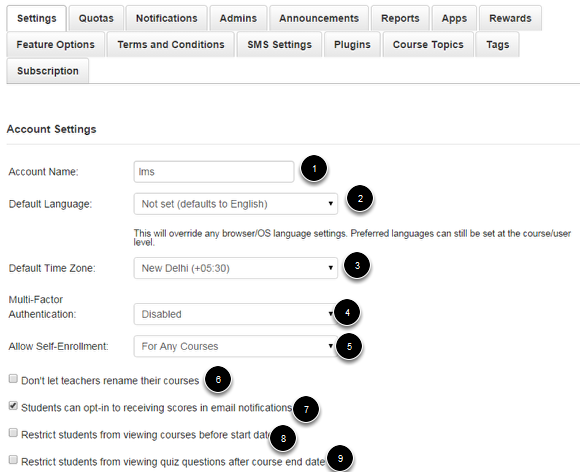 Features can be turned on for the entire account, turned off for the entire account, or allowed so instructors can decide whether or not to use the feature. Instructors can enable course-allowed features on a course-by-course basis. The Rewards tab displays the rewards details. It displays the reward name, alpha mask, Referrer and Referee percentage, Reward, Referrer and Referee Expiry dates, how many points and settings details. You can Add and Manage the Rewards details. The Terms and conditions tab You can Add Terms and conditions for the course. In the SMS settings tab, you can add and update the sender's sms details. In the Plugins tab, You can manage the plugins details of the application. 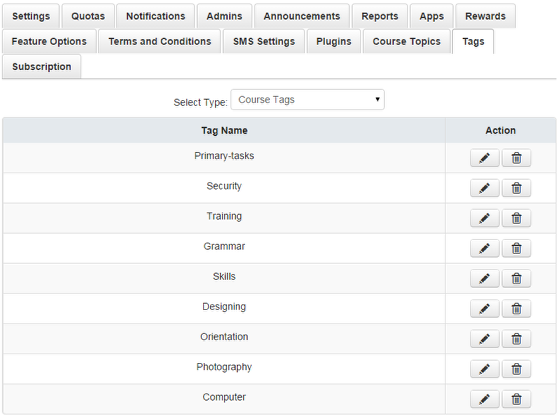 In the course topics tab, you can add or edit the course topics details. In the tags tab, you can edit or delete the tags details. 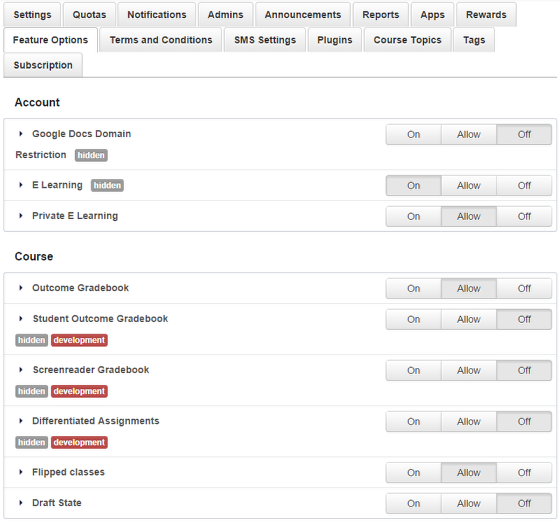 In the subscription tab, you can manage the course subscription settings.